2018 Update: Pinetum Farm Llamas in Granby, Massachusetts, is no longer offering llama hikes. This story remains online for archival purposes. If you are looking for an alternative place in New England to hike with llamas, consider Rowanwood Farm's Llama Hiking Adventures in Newtown, Connecticut. 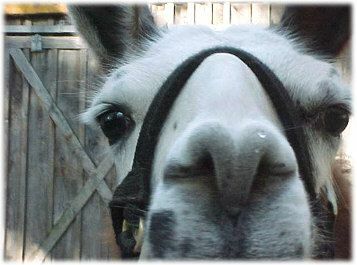 Most children share Dr. Dolittle's dream of talking to the animals, and while you may not be able to teach them to converse with critters, you can treat them to the next best thing... a walk with the animals... by booking a llama trek in Massachusetts at Pinetum Farm Llamas. Not every animal makes an ideal hiking buddy... but this New England farm is home to four-legged trekking companions who are bright, agile, low-key and as eager to hit the trail as you are. Better yet, they'll carry all of your stuff. Karen and David Seiffert have raised llamas for about 20 years at Pinetum Farm Llamas in Granby, Massachusetts. The Seifferts are the third generation to operate this family farm, pronounced PINE-tum, and their interest in llamas sprang from Karen's search for a new fiber to use in her spinning and weaving. "Llama fiber is warmer than sheep's wool because it's hollow," she explained. Karen sells prepared and raw fiber and some yarns and hand-woven items, such as scarves, made from llama fiber at the on-site farm store. In 1999, the couple decided to begin to offer llama outings as a means of generating supplemental income to support the care and feeding of the animals and as a way to introduce travelers to these ideal trail mates. We set out with the Seifferts, their granddaughter Brianna, and three llamas—Damien, Addy and Phoebe—on a mild and bright fall afternoon, and we quickly learned that, though we tried to lead the llamas, we were really not the ones dictating the pace of our walk in the woods. Not to worry—it isn't as though we were being dragged behind charging llamas. To the contrary, the tempo was at times leisurely, at times a bit more lively, and frequently punctuated by pauses as our animal escorts discovered enticing munchies among the foliage. It was serene, really. There was something enchanting about surrendering to the whims of a sure-footed, bright-eyed creature with no sense of minutes passing and no destination in mind. It was a blissful break for someone like me who is always lunging toward the next item on the to-do list, always racing against deadlines and always feeling a need to control my environment—a much-needed opportunity to lose myself and to simply soak up my surroundings. It was also a nice treat to let go of my heavy camera bag for a change: Llamas are sturdy pack animals, and the Seifferts have two pack saddles, which means that the llamas can carry hikers' gear—even lunch supplies such as food, a picnic table and a small barbecue grill. Phoebe, the youngest of the llamas on our trek, was actually on her first trip into the woods without her mother, and David, Karen and Brianna took special care to reassure her along the trail. The family's affection for the animals was obvious. "They're good friends; they're good pets; they're very calming," Karen said. When I asked her at one point about their ages, she turned to her husband and said, "I remember what our kids' ages are—you remember the llamas' ages." The Seifferts are willing to lead groups on llama excursions year-round as long as trail conditions are not too treacherous due to rain or ice and the summer heat and humidity is not excessive. Treks begin at the 50-acre farm, and the farm's trails connect to state-owned trails through the Mount Holyoke Range, which the Seifferts have a permit to use. Tours are customized to match hikers' abilities and can be designed to be appropriate even for young children. Outings can last from one to two hours. All participants—even kids—can have their own llamas if they'd like. Dress appropriately. Wear sturdy shoes or hiking boots, and bring along a hat and jacket. Also bring your camera, binoculars and insect repellent. Don't be afraid to pack heavy. Your llama companion will carry your gear. Llama treks are offered year-round, weather permitting. Fall and spring are perfect times to go. The difficulty of your hike can be tailored to the ability level of those in your party, including young children with short legs.